Keep updated on EvolveArts' activities, special offers, invitations and installations. Simply click here to send us an email and we will add you to the EvolveArts list. If you live in the San Francisco Bay Area, or are visiting, you might have seen Mike Garibaldi's newest art car - Shell Truck - on the road or parked in your neighborhood. 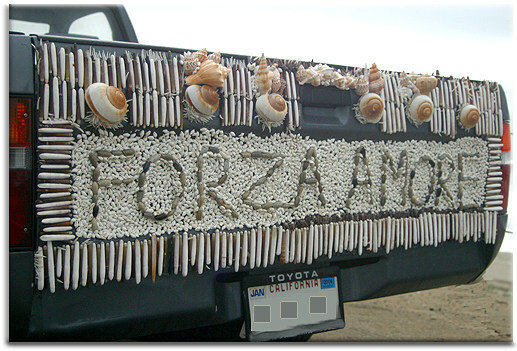 Shell Truck is covered with thousands of large and small sea shells arranged in intricate mosaic patterns. Shell Truck is now available for acquisition! Mike needs to make room for creating more shell vehicles. Own this beautiful, inspiring truck by placing an offer at: Mike@EvolveArts.com. The vehicle is a 1993 Toyota Pickup with 55,000 miles.